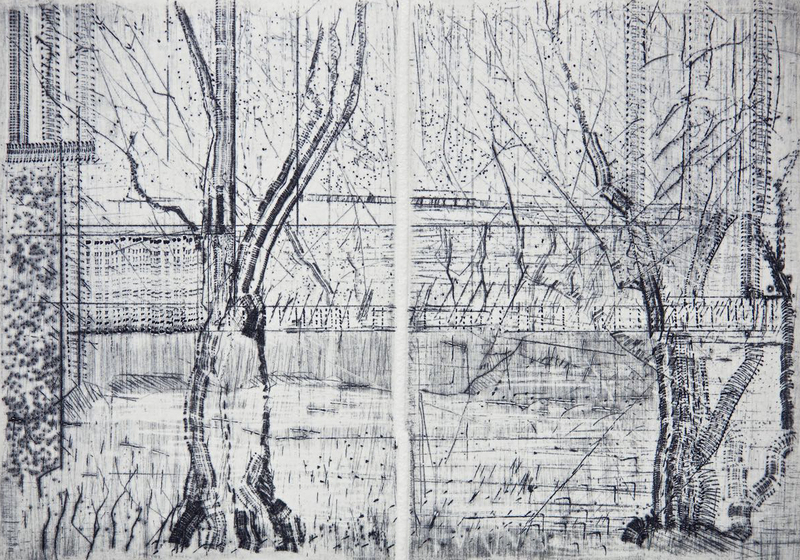 An exhibition of drypoints by Alan Jenkins. Playing with physical materials and media are my main interests. Landscapes, seascapes and nature are sources of inspiration. The working process, sometimes using deliberately random or found marks, creates themes for the work to develop, by combining, memory, imagination and reality. Dry point cutting on copper, steel or zinc plate, using various tools to create line and texture, has a strong connecting link with my sculpture and drawing interests. Many of the plates are reworked several time, giving a tenuous link with the previous prints. The process of recycling is important, sometimes cutting open copper pipes, flattening and finding marks as a starting point for inspiration. Some of my work has been made for use as visual scores, to inspire musicians (CoMA) to perform as improvised music.